Take a close look at the picture on the left. This is a picture of me throwing Tito Garcia on the day I was promoted to sho-dan. As to which application I’m using, it may be better if I give you a bit of history behind it ~ before venturing a guess. The attack for this application was from a backhand strike. 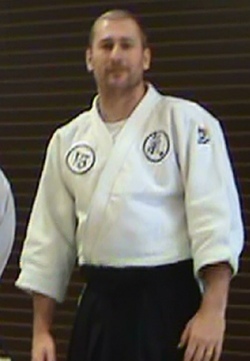 When I was first fooling around with my entry movement for back hand strike applications, I assume I was like most students in my formidable training years ~ seeing an Arm Bar off of every straight attack, and an Elbow Chop off of every round attack. Then one day, while working on Elbow Chop Applications, I realized that I could turn a back hand strike into an Elbow Chop application by parrying the strike down or up and then across ~ unbalancing uke, and opening up the potential for an Elbow Chop that went backwards ~~~ see video). A few days of messing around with this technique with various ukes led to another observation ~ I was killing my ukes. In fact, one day in the dressing area before class, I noticed that many of my training partners literally had softball sized bruises on their biceps muscle. I asked, “What in the world happened to you guys?” They all looked at me in amazement at my lack of understanding, and one of them said, “You ~ happened to us!” The cat was out of the bag, and it turns out that they didn’t see nearly the appeal of my technique that I did. Pointing out that the bruises were all the result of my hand blade striking into their biceps over and over again. It was clear that a change in my training approach was on the horizon. So in the interest of uke esprit de corps (*morale*) I modified the technique again, and only used the tips of my fingers to connect with the biceps and execute the throw. The predictable result? Well you guessed it. Everyone who trained with me inevitably had 4 finger print sized bruises on their biceps ~ instead of a single softball sized bruise ~ still progress never the less. Now why I was not striking the bend in the elbow, is of course a mystery ~ but there is a pressure point that can be activated on the inside of the biceps muscle, and I assume I was trying to activate that pressure point as part of the exercise. A light went off in my head and visions of new opportunities and applications from the backhand attack began to keep me up at night. Unfortunately for me, none of my ukes seemed to be interested in back handed attacks for awhile. As an aside, I do not understand the inherent phobia of taking ukemi for the Over the Back throw. It just does not bother me. 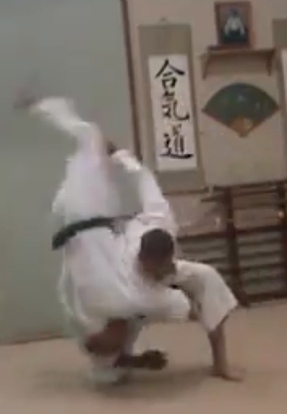 That said, I do have my least preferred techniques to take ukemi from however, and they are the Unbendable Arm Against the Kick and the Scoop. These are my two “un-favorites. Anyway, back to the story. Some period of time later, possibly a few months, one of our female students gave me a back handed strike, and I immediately took her up on the opportunity to do my new favorite application for the Over the Back Throw. Just as I was sliding under her one point I realized: “She doesn’t have the Over the Back Throw!” So I took a knee, to get really low, and did the same lead ~ only at Mugger’s Throw height. I did this very slowly. Uke, not sure where to go, settled on my back, and threw her hips back ~ a natural reaction to avoid the fall, and I slowly swung my free arm to pick her feet off the ground (as in Pivot Over the Back), and the result was a completely controlled application that had evolved into the technique pictured in the upper left hand side of the page. Well at this point, I was hooked and I kept doing it by taking a knee after that. Upon reflection, it seems to me that the entire motion works more like a Body Block ~ except I have uke’s trapped hand in my hand and I am only down on one knee instead of two. Also note the positioning of my left hand extended ~ like it would be in Pivot Over the Back or the Bear Hug Throw ~ to provide the correct energy at just the right time to get uke over the top. Depending on the skill of the uke, my extension of the off hand can be fast or slow to speed the throw up or slow the throw down. To be sure, it is a blended application of a lot of concepts from Classical Technique in our system, but one thing is certain, and that is that I never would have come up with it had I not pushed the envelope to see what was possible ~ and to see what worked for me. Now our system is BIG on this philosophy, and the Classical Technique concept is testament to this notion. Then after the core message of each Classical Technique is ingested and taken root, the student discovers that multiple principles can be incorporated into a single application of technique. The example described above is a bit complex, but it’s easy to experiment with simpler notions. Try incorporating 2 Hand Lift Up sensibility with a Jacket Grab application ~ so you’re pushing uke’s wrist in as you twist it up. If you do it correctly, a new level of the principle “Tap Early Tap Often!” will be learned by uke. To circle up: In a cross training workshop at the beginning of the year, they were working on the Over the Back Throw having transitioned out of the Handshake. Across the board, I thought their hips were very high, and the resultant throws seemed painfully slow, and at any point it appeared that an uke with any degree of sense or flexibility might simply walk around the technique. After the demo, three groups were working on the technique according to ability level. The groups had been humorously described in terms of gasoline octane ratings: 87 Octane (for beginners), 89 Octane (for intermediates), and 93 Octane (for those daring few). I immediately went into the 93 Octane line. I was the second or third nage to throw. When it was my turn, I tried it the way it was demonstrated a time or two (with high hips), but unconsciously reverted to back to my preferred application referenced earlier in this article on an uke who outweighed me by about 50 pounds. He went right over without pause, and I continued the same throw for the rest of my time on point. In the break after that instructional slice, one or two of the Ueshiba aikido guys came up to me and asked me questions about my Koshinage (Over the Back) technique, wanting to see it again, etc. I also spent time learning it with higher hips, and also with uke balanced further back on my rump ~ even through I personally prefer setting up on the small of my back. Anyway, the point is that I was exploring.... Digging deeper... Gaining an understanding about the dynamics and principles involved. In that fashion, repeated often enough and it will become me. Note the deep irimi tenkan entering movement @ 6 seconds leading to shikaku positioning... AT this point uke is toast. His balance can be easily compromised in any direction, and regardless of the decisions he makes, he will be a compliant partner for Spin Around, Pull Down from the Rear, etc.